(EDITORIAL USE ONLY. 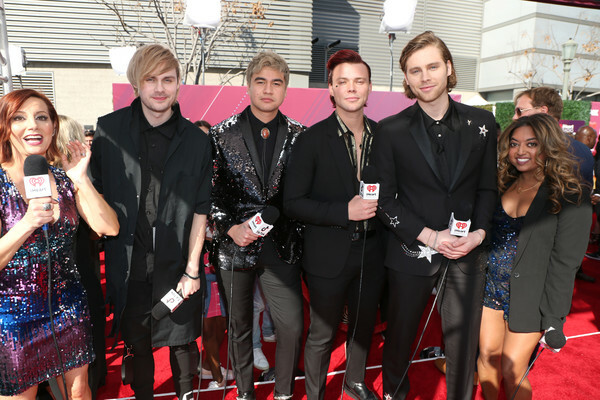 NO COMMERCIAL USE) (L-R) Danielle Monaro; Michael Clifford, Calum Hood, Ashton Irwin, and Luke Hemmings of 5 Seconds of Summer; and Medha Gandhi attend the 2019 iHeartRadio Music Awards which broadcasted live on FOX at Microsoft Theater on March 14, 2019 in Los Angeles, California. Sabrina Carpenter Visits "The Elvis Duran Z100 Morning Show"